The recently introduced Wren V5PF holds the proud distinction of being one of the only two wireless speakers in the market today that will offer Android users a sophisticated channel for Wi-Fi music thanks to DTS Play-Fi technology. By utilizing old-school audio materials as well as classic audio know-how, the Wren V5PF will not only be able to harness the latest in wireless technology so that your ears will be treated to vibrant, room-filling sound, it manages to do so in a beautiful, simple, and convenient way. Of course, when you couple that with an elegant design as well as the proper acoustics in mind, marry that with the speaker’s sophisticated styling, subtle curves, and real wood rich finish, the Wren V5PF ought to be able to find a space in just about any home. 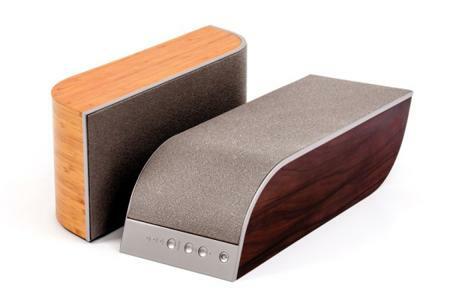 Your ears will definitely be more than happy with the Wren V5 Play-Fi speaker as individual features were specially designed to deliver fearless sound. It has been constructed out of natural bamboo or rosewood veneers that measure more than 0.5” thick MDF board, and the cabinet itself is internally braced to deliver a rigid enclosure that will be free from coloration. The unique internal diamond matrix-grille will offer further protection to the drivers without distorting sound. As for the underside of the Wren V5PF, it has been reinforced with a 4mm low-durometer silicone pad which will help stabilize the chassis and absorb cabinet vibration. Here is a little primer on what DTS Play-Fi technology does – it transforms just about any Android smartphone or tablet (that runs on Android 2.2 Froyo or higher) into a flexible wireless audio device that has Pandora, vTuner internet radio, and a music player which can stream lossless audio files that has been stashed on the device, a local computer or a hard drive that has a DLNA server. Since it transmits “lossless” audio, you can be sure that the music you hear, based on the original quality, is as good as it gets. The Wren V5PF comes with an asking price of $399 a pop.